We're happy to welcome back Caren Crane today! Caren is celebrating the release this month of the third book in her Cross Springs series, Tiara Wars. Don't you love that title? I can't wait to find out what the residents of Cross Springs are up to this time. Check out the rest of the Cross Springs books at Caren's website, connect with her online at Facebook and read her regular blogs at Romance Bandits. Most of us have experienced some version of the following. You make a plan—a great plan. Well-considered, detailed and taking into consideration every possible pitfall. Except for the one you never dreamed might happen, which is inevitably the one that happens. It's happened to me any number of times. Cars break down. The air conditioning unit for the house needs replacement. The plumbing backs up. A beloved pet dies. A loved one falls ill and needs help. Anything at all can suddenly blast out of the blue and hit you like a ton of bricks. That's what has happened to the heroine of my third Cross Springs novel, Tiara Wars. Although no one escapes bad times entirely, Katie Warren has lived a somewhat charmed life. In her small town of Cross Springs, NC, she has always enjoyed popularity and the sort of ease that only the beautiful among us know. But a year ago, her husband of twenty years died. And just before he died, she found out something that rocked her world and made her question everything she believed about herself, her marriage and the bedrock on which her life was built. Katie has gone into full retreat from the world and everyone in her community has noticed. Her best friend Connie Burns, for one, is fed up with her self-indulgent isolation and plans to jar her out of her grief-stricken stupor. But even Connie doesn't know what's really behind Katie's withdrawal. No one does. It takes a chance encounter with a very rude acquaintance, plus a healthy dose of nagging from Connie to launch Katie back out into the world. Once she decides to take action and reclaim her life, Katie rediscovers her dormant drive to get things done. What she finds out about her husband's secrets forces her life in an entirely new direction. One no one expects—especially not Katie! You can read an excerpt of Tiara Wars and the other Cross Springs stories at: http://www.carencrane.com/category/books/. Have your best laid plans gone astray? I know mine have! I would love to hear about something from your life that turned out entirely different from your expectations, whether good or bad. One commenter will win an e-book version of Katie's story, Tiara Wars. I have to say marriage. It's more real than in any romance book. Not always a bad thing, but certainly an eye opener. Marriage certainly turns out differently than most of us expect! I recall talking one of my sisters through the "marriage is like a new pair of shoes" talk a few months after her wedding. It takes a lot of adjustment for most of us! Raising children would certainly fall into that category. While some parents always think that their children will be these perfectly behaved, brilliant kids that never get into trouble - well too often that bubble does pop! If only new Moms and Dads would take the approach to be realistic about their expectations of their children and relax, they and their kids would be happier! Hi, Caren! Tiara Wars is already on my Kindle, and I look forward to reading it when I reach a deadline-free space. It definitely sounds like my kind of book. I think most of my adult life has turned out differently than I expected. But I'm old enough now to realize that even the most difficult times bring a hard-earned wisdom, and some of life's detours have brought me my greatest joys. Janga, you are so right! I totally agree that almost everything that's ever happened to me has been right out of the blue, good and bad both. I wouldn't trade any of those experiences, though, since it's what makes up my life. You are wise beyond your years, my friend! Thank you so much for the book love! I hope you enjoy Katie's book. She was definitely a challenge to get to know, that one. A beauty queen I am not and never have been, but I think all of us share the same struggles in life. Happy reading! Hi Caren! It's the unexpected turns that make life interesting, isn't it? I loved Tiara Wars! And speaking of unexpected--I loved to hate Katie at the beginning of this series! It's a testament to your talent that I loved her and was rooting for her in this book! Thanks, Kieran! I saw you were here yesterday and thought it quite appropriate that Southern fiction was taking over this week. Hope to see you soon! 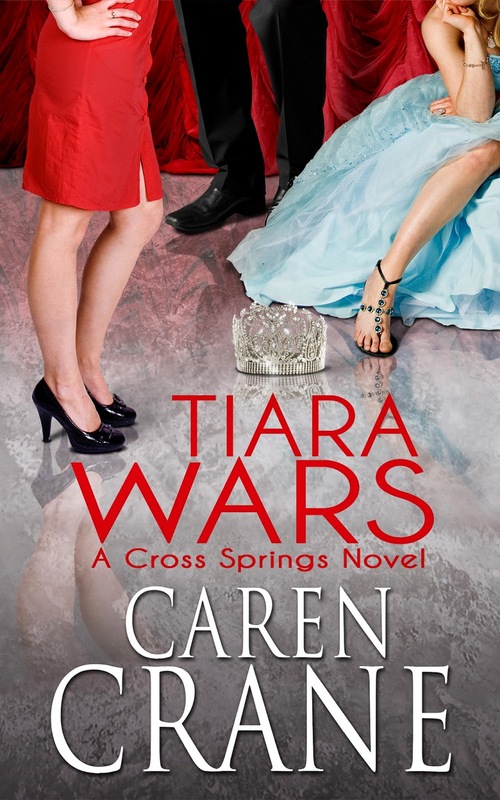 Hi, Caren--I have my copy of Tiara Wars and am looking forward to it. I love Cross Springs! Unexpected twists and turns, eh? I expected to love the school I attended my freshman year in college but ended up not liking it much and transferring out. Nancy, isn't it terrible that the world expects us to know, at 18, exactly what we want from life and higher education? I had NO CLUE what I wanted at 18. Heck, I'm still not sure what I want from life at times! Thank you for the kind words about Tiara Wars and Cross Springs. I love that town and its very "real" citizens. They are all in fine form in Tiara Wars. I hope you enjoy the book! I hope you enjoy Cross Springs and I look forward to hearing from you! Just wanted you to know I downloaded Kick Start earlier today...will let you know what I think...good luck with you new book. Thank you so much! I hope you really enjoy it. I put poor Linda through the ringer! Also, I managed to get into my website and just got everything updated. Hooray! I was only, like, 4 months and 2 releases behind. Doh! I wanted to be a teacher when I grew up. I had the marks, most certainly. Then my sister couldn't be a teacher any longer because she and her new husband moved far away. She would have had to have started over. Instead she was older and raising a family, so she started typing for a neighbour when her baby was sleeping. It was that moment when my light bulb went off - when I was 13! *I* could be a secretary in offices until I got married and started a family - and then I could take it a step further and start a typing business from home! So that's what I did and I haven't regretted it for a moment. I was able to be home with my kids (even if I had only 2-3 hours sleep per night and had to catch an hour of sleep at a time during the daytime when my customers weren't picking up their work and the kids were in school). I absolutely loved it. We were able to attend a different local playground five days a week as a rule, we had friends over, they played outside a lot, we met the neighbours and had "play days" before they were known as such, and I took them to a toddler program, as well as libraries, to do crafts. Now, almost 30 years later (my eldest turns 29 tomorrow), I still have my typing business, although I have added other secretarial jobs into the mix, plus I edit books for typos, things that don't make sense to me, and moving information around to make it flow better. (I don't touch plot line, as most editing is for non-fictions.) I am SOOO glad that my sister paved the way for me (although I took it a step or two further). Sabrina, with kids you just NEVER know what you're going to get, do you? They are all wonderful, but so individual and often nothing at all like you expect! Your son is a sweetheart, which is a real gift. Even with other things being a challenge, a great disposition is a real blessing! Hi Caren! Congratulations on the release of your next Cross Springs book. What an intriguing premise! I actually think sometimes those best-laid plans aren't actually the best things for us. The machinations of fate can make things MUCH more interesting! Hiya Dishes! Thanks for having my friend Caren as your guest today! Congrats to Caren on the new release!!! Looks and sounds awesome :) Ummm... I thought I'd be married by now w/ a couple of kids and I'm very happily single with my furbaby!!! Thanks, Erin! I think for lots of us, we dreamed of pairing off early and starting a family and end up single longer than expected, with much furrier children than expected. :) Of course, I did everything backward and had a baby, then got married, then had a couple more babies, then added fur babies. Of all those, only the fur one is still at home. Thank goodness for feral rescue kitties! :D I hope your different route is wonderful and full of love, fun and adventures. I'm sure it will be! Hi Caren!! You know how much I LOVE Cross Springs! Can't wait to read Tiara Wars!! I'm so excited for this story. It's totally cool to visit the town again. As to crazy things going wrong...ohhhhh yeah. Unplanned kids, planning for kids and not getting them...that was unexpected. Snork! Then there's the jobs that don't turn out to be the job you actually were hired for, or the boss changes and so does the atmosphere at work...eek! And in writing, the book that sells isn't the one you'd planned the sequel for, and now have to write. Or, like me, you start getting traction in your career and your editor up and dies! Yikes! But hey, it makes life interesting, right? :> Or keeps you on your toes, I'm not sure which. Hahahah!! Jeanne, thanks for the Cross Springs love! I hope Tiara Wars meets all your expectations. I really did love writing Katie's book, although she was very challenging at times. :) I can SO RELATE to all the unexpected things you mentioned. Especially those unplanned children. I had three of those! It worked out well for all of us, but man were those baby/toddler years a wild ride! Hi Caren! Thanks so much for being here today. I've been driving for the past 14 hours which is why I've been MIA today. I have Tiara Warson my Kindle and am looking forward to another visit to Cross Springs! Definitely marriage. I was married to my husband for 39-1/2 years when he died last year. We had planned to grow old together. Our family seems to have problems with parties. Both happened when I was much younger, many years ago. We planned a big 50th wedding anniversary party for my grandparents. We had a lovely 3 tiered cake and many people invited. Early that morning, my grandmother's mother, my great-grandmother,died. It put a pall over the party and most people didn't attend knowing we really wouldn't be celebrating. Another time, we planned a big birthday party for my mother, most likely her 40th. Her birthday was Nov. 8 and an evening party was planned at our house. We lived in the NE corner of New York state. This was 1965 and it turned out to be the night of the major blackout that put most of the NE US and Canada in the dark. We ended the party early by candle light and everyone went home to try and stay warm. My husband was in the Air Force and is now retired. We learned early on in our marriage to be flexible with celebration plans. Our wedding had to be postponed because they extended his tour of duty in Vietnam. They then shipped him back over 5 weeks after the wedding. We decided then that holidays, birthdays, etc. were to be celebrated when we could. We were not celebrating a date but the person or event, and that could be done anytime. When our girls were little, we waited for almost a week to celebrate Christmas when Daddy got home.